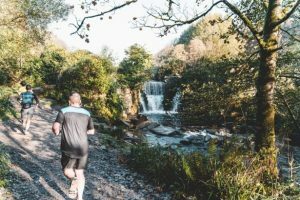 PVW Running group started in August 2018, located in a stunning area in Penllergare, that boasts lovely trail runs, two lakes and a waterfall, along with beautiful countryside to run through. The group is led by Paul Harris ( 3M's Gorseinon Road Runners ), and he is ably assisted by numerous friends from his running club. Paul says "I didn't really know how many people wanted to take part, and living a busy life with work, family and my own training commitments, meant I wasn't sure how much time I would be able to devote to getting the group up and running. Anyhow, I made a page on facebook and a twitter account in July. I recruited some friends from my running club to help promote it through their contacts on facebook as well as doing my own. The response was amazing, I think we had somewhere around 300 people join the page within the first month. Which meant, come our first session I wasn't really sure how many would turn up, I was expecting between 10 to 20 people to show and give C25K a go. I can remember being in the car park 30 mins before we were due to start and people started arriving, 20 minutes later, it was like a scene from Convoy ( showing my age here ! ), the car park was full and people needed to park elsewhere to join in. I think we had around 50 people turn up for that first session, some had already completed the C25K but were keen to run with us anyhow. So, we'd already agreed that we'd split the groups into 2, one for the people just starting to run, and an 'advanced' group for those who could already complete 5K. From there, we haven't really looked back, every Sunday, no matter what the weather (we've only cancelled a session once due to high winds ! ), 10am, we meet, run and have some coffee at the end. 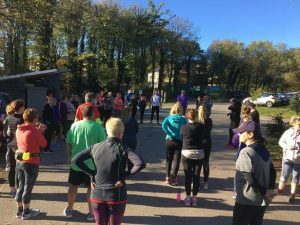 The first lot of C25K graduates, completed their programme in early October, with around 33 people finishing our timed 5K run through the woods. It's still popular, in fact, our 3rd intake started on the first weekend of the new year, we had around 100 people turn up !! So many, that we had to split the C25K group into smaller groups to be able to manage the numbers and provide help and encouragement along the way. Obviously, people drop out, decide its not for them or complete 5K away from the group. But to date we have helped over 70 people ( Im not sure of the exact numbers ) achieve their 5K goal. In addition, around another 30 have now completed the 10K programme ( which we take the advanced group through ), we still have many regulars who show up each and every week. In fact, quite a few have gone on to complete half marathons, one has even done a marathon and has entered Ironman Wales this year , whilst others have signed up for both marathons and ultra marathons, we've created a monster, but a good one !! It's great to see the improvement people make in a short space of time, they tend to go from worrying about their pace to asking if their ready to sign up to a local 5K or 10K race, my answer is always the same, 'yes you are, you just need to believe that you can do it!" "
It was quite nerve wracking at the start, having to speak in front of so many people, but they were all very attentive and keen to learn, so it made it a much easier task. Each week we encourage people to complete their 'homework', the two additional runs that they are required to do independently of the group. Many arrange to meet up with others from the group to do the runs together, which is great to see. Whilst some of our original intake also arrange to meet up with beginners to take them through their paces. Our aim is to try and make the group self-sustaining and by that, we try and encourage those who have completed the C25K programme to help when we have a new intake. We're lucky to have a number of people keen to do this, and they are now taking the 4th intake through their paces of the C25K programme. The advanced group numbers around 20-30 people each week, and we take this group through some speed work, hill work, designed to improve their endurance and pace. On top of this, we have run 2 strength and conditioning sessions each week in a local gym, with exercises that focus on the ABC's of running, agility, balance and coordination, along with some strength work to help prevent injury and improve stamina. We have even designed and purchased our own running T-shirts, which can be regularly seen at the local park runs in the area in Swansea and Llanelli. 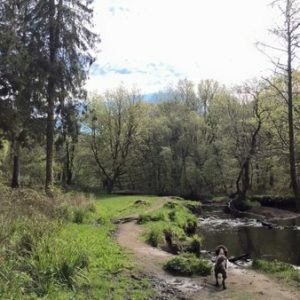 One bonus from this, is that we were able to donate some money from the t-shirts, to the Penlllergare Trust, who are responsible for the maintainance and upkeep of the woods. Our plans for the future ? Well, we are seeking funding to get some of the original intake, who help the beginners, through the LiRF course. On top of that, we hope to run an event in the woods, which we will charge a small fee for, the proceeds of which we also plan to donate to the trust. 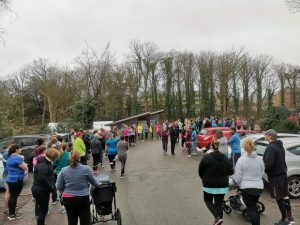 After that, who knows, I never thought it would be as popular as it is, as I speak we have over 580 people part of the facebook group, maybe more of them could be tempted to start their C25K journey with us !